Problem. Create a display typeface for advertisement purposes. The typeface is a bit rough and square-built with a pronounced oriental touch (Chinese word tongyin means bronze molding). 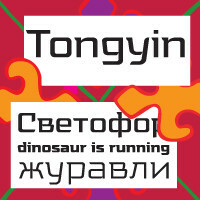 Tongyin declares its ties to Russian constructivism and comes in four weights: light, regular, bold and black. It matches well the moderately rustic accident typesetting frequently used for classified ads and announcements in Russian newspapers.